I've been looking forward to The Vanishing of Ethan Carter from the very moment that the guys who made Painkiller and Bulletstorm announced that they were working on a "weird fiction horror story" with a focus on exploration and discovery. The team has been coy about it ever since, offering up some very pretty screens and teasers but little in the way of how it will actually play, but today a new Ethan Carter website was opened to the public, bringing with it a firm release date and 13 minutes of gameplay, complete with developer commentary. The trailer bounces around here and there, due to narrator Adrian Chmielarz's desire to avoid spoiling any big moments during the early stages of the game, but it still offers a good look at how detective Paul Prospero's supernatural abilities will function. The system seems subtle and well-integrated into the setting, accessible without being overbearing; Prospero's talents, meanwhile, remind me a little bit of the supernatural elements in Phoenix Online's Cognition and Moebius games, but will hopefully be executed with a bit more of a surer hand. 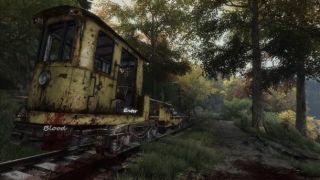 When you're done with the video, feel free to pop over to ethancartergame.com , the new Vanishing of Ethan Carter website that collects everything there is to know about the game in one handy place. It also provides links to a "special pre-order edition" on Steam and GOG, which includes the full soundtrack, a "making of" album in PDF format, wallpapers and other stuff. On, and the launch date: The Vanishing of Ethan Carter comes out on September 25.